YOU’RE GOING TO NEED IT TO SURVIVE! While the ever distracted and perpetually preoccupied American public is just recovering from the onslaught of the Super Bowl and readying itself for two continuous weeks of the vicarious videotaped splendor of the Winter Olympics from Russia, ominous signs of the inevitable collapse of the American economic and social order continue to grow. Regrettably, very few of these signs are ever discussed on any of the business channels. We hate to break this to you, dear reader, but the so-called prosperity of Wall Street and its banking elite no longer reflects the state of affairs of the general public, especially the middle class. And speaking of the middle class, it is this group that stands as a real buffer between a totalitarian regime dominated by elite tyrants ruling over a peasant proletariat. Get rid of the middle class and you wind up with third world banana republics such as Honduras and Zimbabwe; or even worse, North Korea. Things have never been worse for the middle class since the Great Depression of the 1930s. Don’t believe it? Take a look at some of these stunning statistics which illustrate an impending peril for the middle class along with, perhaps, the demise of democratic republican government in this country. 1 In January, the Commerce Department reported that personal income had cratered 3.6% during the month, by far the largest decline in over 20 years. 2 Disposable personal income fell by even a greater margin – 4% – the single largest monthly loss in half a century. 3 Median US household income has fallen for the fifth consecutive year. 4 The rate of home ownership in the US has fallen for eight straight years. 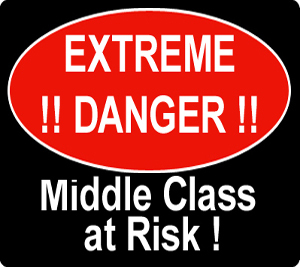 5 In 2014, only 44% of Americans consider themselves to be middle class as compared to 53% in 2008. 6 Just five years ago in 2008, 25% of all Americans in the 18 to 29 year old age bracket, believed themselves to be “lower class.” By 2014, an astounding 49% of that age group now does. 8 According to Realty Trace’s December 2013 “US Home and Underwater Equity Report,” nineteen percent of all properties with a mortgage are underwater. 9 Total US consumer credit has risen by a staggering 22% in the last three years. 10 Unbelievably, 56% of all Americans now have subprime credit. 11 Average US household credit card debt now stands at $15,270. 12 Total US student loan debt through 2013, stood at a whopping $1.049 billion, an increase of 11.1% in just one year. 13 Average student loan debt per student is now $32,258. 14 The average mortgage debt in the US is still very formidable, nearly $150,000 per household. 15 There are 46.5 million Americans now living in poverty. 16 One of out every four part time workers in America is living below the official poverty line. 17 According to recent numbers from the US Census Bureau, an all time record of 49.2% of all Americans are receiving monthly disbursements from at least one government agency or program. 18 In the past five years, the US has spent an astonishing $3.7 trillion on welfare programs. 19 The percentage of Americans now living in poverty has been at 15% for nearly three consecutive years, the first time that has happened since the “War on Poverty” began in 1965. 20 Since Barack Obama’s election of office five years ago, the number of Americans living on food stamps has risen nearly 47%, from 32 million to nearly 47 million. 21 A total of 2,637,239 US jobs were outsourced in 2013 alone – over 53% high paying manufacturing jobs. 22 The true US unemployment rate, according to John Williams of Shadow Government Statistics (shadowstats.com), is not at all the 7% official figure of the US Bureau of Labor Statistics, but actually is over 23%. 23 Thirty percent of Americans say they will need to work into their 80s so as to be comfortable in retirement. 24 Sixty percent of the jobs lost during the 2008 – 2009 recession, were middle class positions; they have accounted for only 22% of the jobs created since then. 25 The total official US debt stands at $17.289 trillion. The actual US debt, when taking into consideration such unfunded liabilities as social security, Medicare, Medicaid, and government pensions, etc., is estimated six to ten times that amount, between $120 – $200 trillion, a figure that cannot and will not ever be paid. Ladies and gentlemen, these are staggering figures and they point to a conclusion of not only an eventual evisceration of the middle class but life as we have come to know it in the United States of America. With the exception of Ron Paul, no American politician has had the courage or intelligence to rein in the above index of misery facing the American public. It may actually already be too late for any political solution to our dilemmas. It is going to be up to each individual, family, and community to prepare for their own future welfare and protection. Part of that protection should definitely include the acquisition of precious metals to protect and insure your hard earned wealth. To learn more about the rewards of precious metals investing, including how to fund your existing IRA with gold or silver, call Liberty Gold and Silver seven days a week at 888.751.3330. To learn about the most generous affiliate marketing program in the precious metals industry, please visit the Liberty Gold and Silver Affiliate Marketing Program. We're happy to spend as much time as you need to discuss the details with you. © Copyright 2013 Liberty Gold and Silver, All rights Reserved. This entry was posted in Gold and Silver News. Bookmark the permalink. 4 Responses to DANGER ALERT!!! The one Big sign, that Americans don’t owe any Mortgage payments, all Foreclosures are void, the statute of limitation on fraud is three years AFTER, the person discovers the fraud, we will be able to put the Federal Reserve out of business!, and raid there secret offshore accounts. Banks can only extend “credit” to member banks, based on “stocks” of the member bank. *member upon the security of a home mortgage. (4) The term ”member” means any institution which has subscribed for the stock of a Federal Home Loan Bank. (5) The term ”home mortgage loan” means a loan made by a *member upon the security of a home mortgage. (6) The term ”home mortgage” means a mortgage upon real estate, in *fee simple, or on a leasehold (1) under a lease for not less than ninety-nine years which is renewable or (2) under a lease having a period of not less than fifty years to run from the date the mortgage was executed, upon which is located, or which comprises or includes, one or more homes or other dwelling units, all of which may be defined by the Board and shall include, in addition to first mortgages, such classes of first liens as are commonly given to secure advances on real estate by institutions authorized under this chapter to become members, under the laws of the State in which the real estate is located, together with the credit instruments, if any, secured thereby. (7) The term ”unpaid principal,” when used in respect of a loan secured by a home mortgage means the principal thereof less the sum of (1) payments made on such principal, and (2) in cases where *shares or *stock are pledged as security for the loan, the payments made on such shares or stock plus earnings or dividends apportioned or credited thereon. of regular weekly, monthly, or quarterly payments made directly in reduction of the debt or upon *stock or *shares pledged as collateral for the repayment of such loan. Total US student loan debt through 2013, stood at a whopping $1.049 billion, an increase of 11.1% in just one year. You SURE that isn’t TRILLION instead of billion ? Welcome to the new world! The price for all the free stuff of the past will be come due and it will be paid by all, but…….those getting most of that free stuff will be decimated and destroyed by the coming money bubble crash. It will be a well deserved end to poor monetary policy and socialist ideologies. Is The Precious Metals Correction Over?